Looking for a magic villa playhouse? A lovely fairy-tale house for the little girl who loves all things pink. A unique design, open aspect and attention to detail make this playhouse sure to be a hit with the little girls in your family. This is a superb, roomy children’s playhouse which is a very colourful bright pink and purple complete with windows, a stable door and gate. The children will love playing inside and will enjoy hours of fun. Made from special injection moulded plastic it has plenty of graphics and pattern and will look bright even on the dreariest of days! It has the additional bonus of being easy on the pocket too. The attention to detail with this playhouse is amazing. The beautiful pink and purple colours combined with a white picket fence and heart design on the door, make this house a dream come true. The large windows make this house feel more spacious as well as allowing parents to be able to see into the house easily. 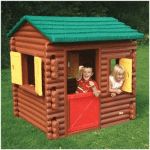 On the lower end of the price scale for playhouses this would make a wonderful addition to your garden toys. Due to its size and colour scheme it wouldn’t look out of place inside, in a playroom for instance. 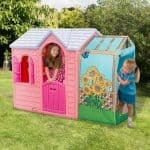 The Keter Magic Villa Pink & Purple Playhouse: How safe is it? As with all Keter’s playhouses, this particular playhouse provides a safe environment in which your child can explore, imagine, create and enjoy for many hours of endless fun. Below we discuss any safety issues that may concern parents during the purchasing process. Overall: Due to its fantastic open design, this playhouse is great for parental supervision of very small children. Because of the comparatively large windows, there is no corner of the playhouse that cannot be seen from all angles making this a very safe environment for even the youngest child to play. Windows: As said previously, the windows are very large, with no shutters or open and close facility to cause concern for little fingers. Door: There is a lovely little stable door/gate for entering and exiting the playhouse. This can be opened from above and so poses no concern to little fingers once again. Overall, this playhouse has very little features and has an open design that encourages safety amongst children and their parents. A fantastic all-round, safe purchase for cautious parents. The Keter Magic Villa Pink & Purple Playhouse: How easy to build? Keter playhouses are fairly simple to put together. This magic villa playhouse has a couple of different features to build in, unlike other playhouses, however with the slot, click and tighten method you will have this house put together in no time at all. All the pieces slot into place and you simply need to tighten with any screws provided. Should you experience any issues, the playhouse comes complete with a thorough instruction manual, in several languages, that will get you going again in no time. You can see an online version of the instruction manual by clicking this link. 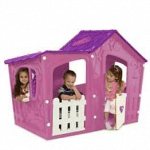 The Keter Magic Villa Pink & Purple Playhouse: What is the overall quality like? Keter is an Israeli company known for its outdoor buildings, sheds and playhouses. The company is known for producing quality products that it distributes within Europe and the United States. At first glance this looks like a magical, fairy-tale playhouse and we have a feeling that the magic rubs off on the quality and construction as this is a very sturdy playhouse. With its special injected moulded plastic, the walls are solid and have great attention to detail with the various designs and patterns on the walls. Being unique in its openness to the viewing from the outside, we feel this house would be fantastic for smaller children in particular. Due to the construction it would last for many years of play and the vibrant pink colour is most definitely there to stay. Great quality, great build, great design – what more could you ask for? Our final thoughts on this product are that it is a fantastic little playhouse with a design that is great for both children and parents. 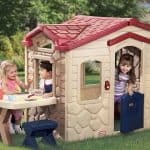 At the lower end of the price range for similar sized playhouses, this particular playhouse offers fantastic value for money. All in all this is a little girls dream house with the pink and purple colour scheme and a little heart design on the gate – simply wonderful. This playhouse is more roomier than most. I have two small children and they love this thing. I like it because it is mostly all open so I can keep a close eye on them. They have so much fun in there. They usually bring out some small toys and camp out in there during the day. They love to play store in it as well – that is their favorite game to play together. I am glad I bought something like this. I like that it is pink and purple since both of my children are girls. 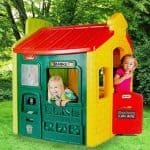 This is one of the plastic playhouses that I have found that is big in space but not big for the pocket. The design is really nice with a nice combination of pink and purple colors. The molded plastic with all the patterns just adds to the beauty. It is not very congested and is quite open, which helps me to keep an eye on my two daughters quite easily. They love it indeed, as they invent and play all sorts of games in it. And it is quite easy to maintain and doesn’t let me break a sweat to keep it clean. It was a good idea that I bought this for my kids. The house looks great as a decoration as well inside our own abode!